Strange helmets and armour, futuristic medical technology, and weapons unlike any in the known world all appear in this trove of treasures for use in your science fantasy or science fiction campaign. Each of this set's 54 beautifully illustrated, full-colour cards includes space on the back for players to add notes on their loot. 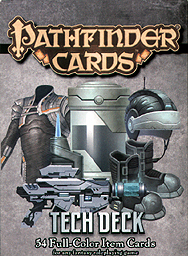 These Pathfinder Item Cards are designed for use with the Pathfinder Roleplaying Game, but are compatible with any fantasy roleplaying game.